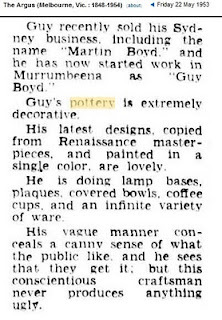 Guy Martin a'Beckett Boyd, born at Murrumbeena in 1923 (12 June 1923 – 26 April 1988) was the second son of Merric and Doris Boyd. 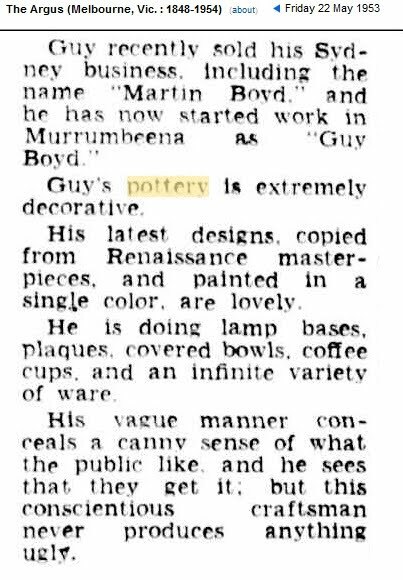 Guy Boyd's first business venture was a very successful commercial pottery studio. One of the main products was ramekins. You see them everywhere. Most are in matching reverse colours. Just because they are signed "Guy Boyd", people think they are collectable. In the future they probably will be but now they are a dime a dozen. You can usually find at least one in every antique shop. They seem to breed as fast as old metal coat hangers. If there isn't one there today, there will be tomorrow. Legally, they are "Boyd", but remember that it is unlikely that any member of the Boyd family were within several hundred miles of them when they were made. The pale ones at the top (which are genuine Guy Boyd from his Melbourne studio in the mid sixties) have sgraffito (incised) along the sides before glazing, a popular design. They were sold in sets along with the soup tureen. They are 120mm wide and 45 mm deep plus 30mm for the handle. Sadly, the tureens don't survive, but the ramekins do. 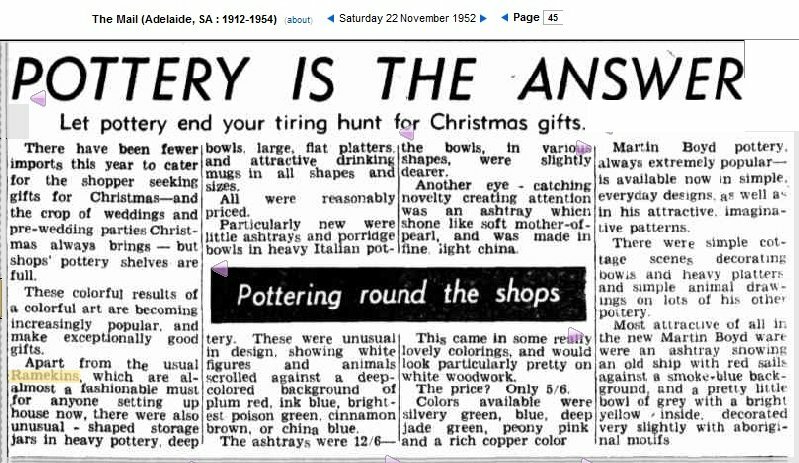 In the late 1950s, Guy had his works at Crosbie Park Avenue in East Bentleigh After his return from Sydney, Guy opened a shop at 247 Bridge Road Richmond. In the mid 1960s he operated from the Ray Cook premises in Carey Street, East Bentleigh. 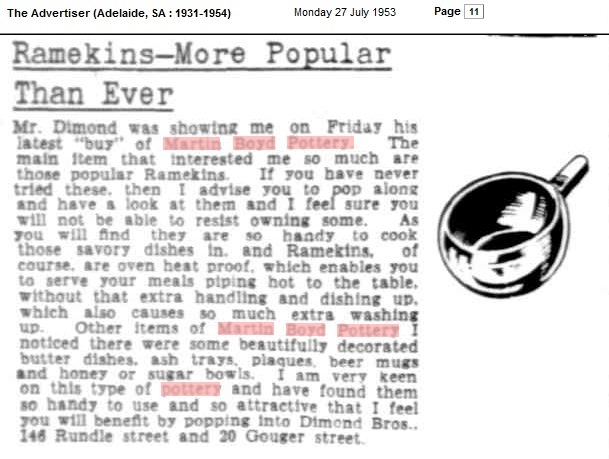 The similarity of the Boyd and Cook ramekins makes me wonder who influenced who at this time. 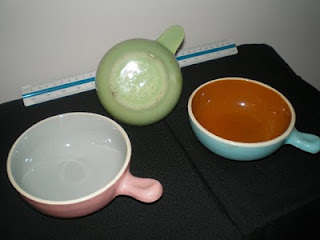 These have no chips cracks or crazing and have a matt monocolour glaze. In 1965, Guy gave up pottery for a full-time career as a sculptor, and began exhibiting at the Australian galleries. Guy Boyd married Phyllis Nairn with whom he had seven children, some of whom have also gone on to become sculptors, writers and artists. He died in 1988. Please be aware when you see the name on the base. 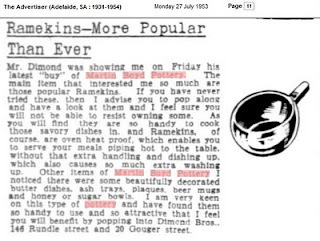 In 1946, while Guy was studying at the East Sydney Technical College, he worked at night with Norma Flegg in her basement pottery in Cremorne. 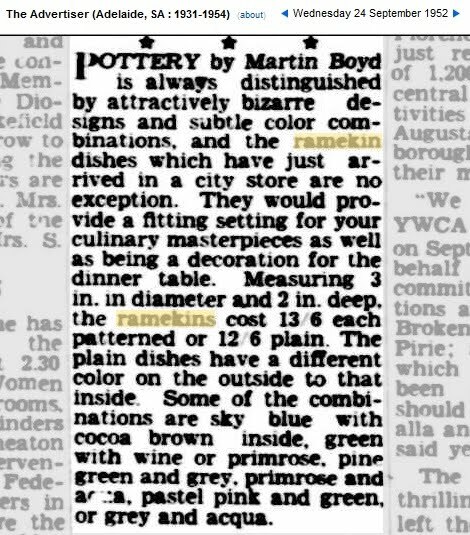 They originally used the name “Guy Boyd” incised on the base, but in 1948, they began using the name “Martin Boyd” after Norma’s husband Leonard joined the company. Guy returned to Victoria in 1950 and the company in Sydney continued to use the name until it ceased production in 1964. His Melbourne pottery operated from 1952.) The Sydney pottery developed their own high quality glazes and at its height, employed up to eighty people. 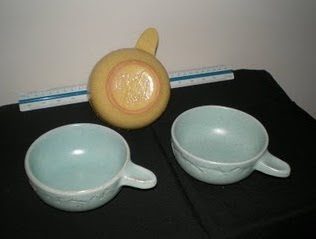 They also used a variety of other names as they produced pottery for department stores and commemorative wares. Guy Boyd was not influenced by Ray Cook. 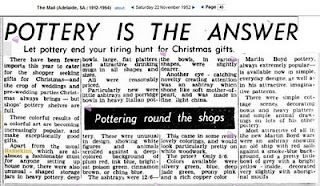 He sold his pottery to Ray Cook along with the rights to using his designs in 1964. At this time he stopped making pottery and began making sculpture instead. Derry Talvainn (nee Boyd) Guy Boyd's daughter. Everyone likes to think well of their parents, but in my opinion, Ray Cook had been making this design from the late 1940s. 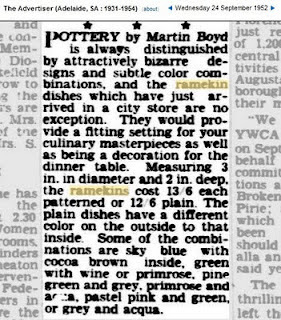 If you are to view the two dispassionately, the difference in design can be seen in the ramekins made by Boyd in Sydney compared to those made by Ray Cook at the time. Essentially the difference between the two styles made in Victoria was the speckled finish used by Boyd that was not continued by Raynham who continued with their standard design. Not only that, but I consider that the quality of manufacture of Raynham was better than those of Boyd. If you are to believe the entry on Boyd by Ford, then you would have to conclude that Ray Cook was using this design decades before Boyd started up in Bentleigh. I have just found, in my nanna's house, a brand new in box set of six Guy Boyd ramekins!! They are just gorgeous.